How to build News components – How can we help you today? Overview The News component provides you with the ability to display multiple headlines, abstracts, and images in a news feed. Ideal for data such as social media streams or RSS feeds. The News component lets you format data for use in a news feed, such as Twitter and RSS feeds (eg: Google News). Here is the structure of the News component. 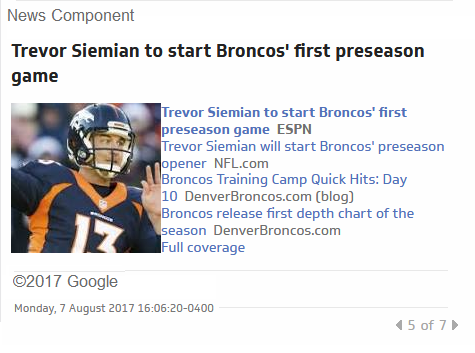 Each of the sub-components in the News component is pre-formatted. This section of the Klip Editor is called the Component Tree. This section provides examples of the different ways to use the News component. 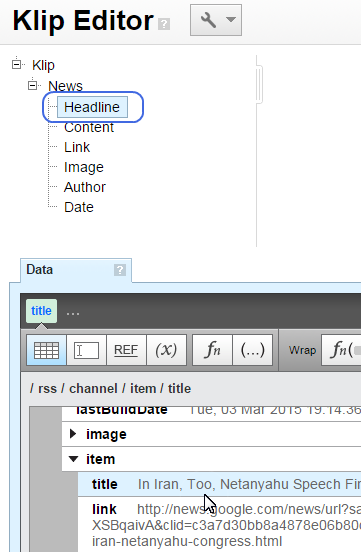 This article walks you through bringing an RSS feed from Google News into Klipfolio. Click the Set up a New Data Source button. You are now in Klipfolio’s New Data Source page. Keep this page open. Navigate to your news feed: https://news.google.com/news/. Scroll to the bottom of the page and select RSS. Navigate to Klipfolio’s New Data Source page. Paste the RSS URL into the URL text box. For Data Format select XML. From the Data panel, use the XML results to reference each sub-component in the Component Tree. 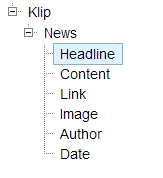 In the Component tree, select Headline. In the Data panel, under item, select the title node. In the Component tree, select Content. In the Data panel, under item, select the description node. In the Component tree, select Link. In the Data panel, under item, select the link node. In the Component tree, select Image. In the Data panel, under channel and under image, select the url node. In the Data panel, click the Insert Literal String or Number button. Paste the URL of your image into the Insert Text or Number box. In the Component tree, select Author. In the Data panel, under channel, select the copyright node. In the Component tree, select Date. In the Data panel, under item, select the pubdate node. The publication date appears at the bottom of your Klip.